For Your Edification and Entertainment – Matts Notes is Proud to Present More Interesting Trivia?! Leaping to a Ludicrous Leap Year Conclusion – aka Were The Mayans The Original Douchebags? There have been approximately 514 leap years since Julius Caesar created the Julian Calendar in 46BC. The Mayan calendar, which forms the underlying premise of the movie ‘2012’ with John Cusack; released in plenty of time so the producers could raise the millions of Euros required to secure their safe passage on board the American ark 😉 – did not use leap years to synchronise the months to the seasons. In fact, the Mayans had several calendars, one of which was known as the Long Count. “[the Long Count] was set up around 355 BCE, and had as its chosen starting date 0.0.0.0.0, which corresponds to 11 August 3114 BCE. 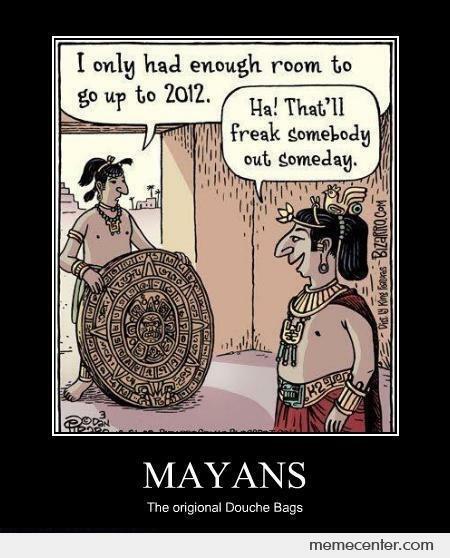 And on 21 December 2012, the Mayan Long Count calendar will read 13.0.0.0.0. Now here’s how it works. Our numbering system is based on 10. But the Mayans had a counting system based on 20, so most of the ‘slots’ in their calendar had 20 potential numbers (0 to 19). The calendar read a little like the odometer in your car’s speedo (which run from 0 to 9). The extreme right slot (of five slots) would count through the days, and when it got to 19 days (0.0.0.0.19) would reset to zero, and the next slot across to the left would increase by one (to 0.0.0.1.0). Therefore, if you subscribe to a conspiracy theory centered around the number 13 you may feel inclined to splurge on ‘buy now, pay later’ items, knowing that you will never have to cough up on the horrendous credit card interest rate. Go for it, Gerry Harvey won’t mind. Hmm, hands up all those of you scared of the number 20! So, bearing in mind that we only started using leap days 2,059 years ago, and the Mayans never used leap days when they set up their calendar to begin in 3114BC, the math that calculated the End of Days is flawed – sorry Arnie. Check back on Thursday for Even More Interesting Trivia?! This entry was posted in Commentary, Humour, Latest Posts, Short Stories and tagged 2012, Dr Karl, Leap Year, Mayans, Trivia. Bookmark the permalink. Hey there just stumbled upon your blog via Google after searching for interesting trivia, or something similar (can’t quite remember exactly). Anyhow, I’m delighted I found it. Interesting read and a good point there from Tim, I’ve read people saying the leap-year thing around and thought that, nice to have it confirmed! Why though should the calendar stop on 13.0.0.0.0? A clock for instance has 12 or 24 as it’s max large-unit, but continues on the small-units to the very moment before it needs a 13 or 25 before resetting, so surely it should continue beyond 13.0.0.0.0 until all of the zeros have hit their maximums, giving us almost 400 more years beyond December 21, 2012. I agree as well. I would be more concerned at 20.20.20.20.20. Although it appears the calendar does support a sixth, seventh and eight set of base 20 numbers, BUT what is interesting, if you let me quote Wikipedia… “Note that the name b’ak’tun is a back-formation invented by scholars. The numbered Long Count was no longer in use by the time the Spanish arrived in the Yucatán Peninsula, although unnumbered k’atuns and tuns were still in use.” So the Mayans didn’t have a name for the latest division (b’ak’tun) of the calendar and was invented in the 1900’s it seems. Doomsday 2012 completely debunked. Wow, thanks Tim. I really appreciate the effort you have gone to to contribute. Thanks for your comment Tim and the excellent link you provided. I have read so many contradictory opinions on the topic to date that it would appear even the ‘experts’ cannot agree.